This week, you can find Bigfoot at the Miami Beach Botanical Gardens... that is, a large sculpture of a man with unusually large feet. Idan Zareski's "Bigfoot" will be unveiled on Tuesday at the Gardens. The sculpture, "Bigfoot," has already been featured in other countries all over the world. Bigfoot will be unveiled this Tuesday at the Miami Beach Botanical Gardens. 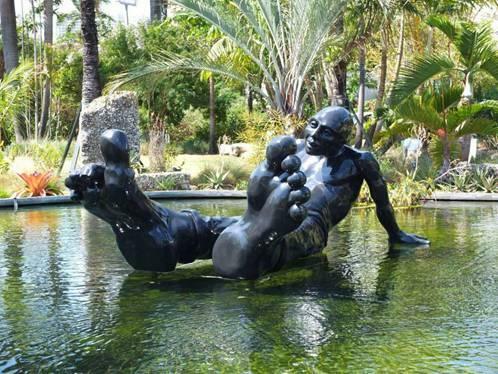 According to a press release announcing the sculpture's stay, "Bigfoot’s current home, the Miami Beach Botanical Gardens, warmly welcomed the sculpture to temporarily reside in their natural pond but the sculpture is seeking a permanent home at a private residence, public venue or cultural/governmental institution." This week's event will be one of the first big events to kick off Art Basel Miami Beach, which starts next Wednesday, December 6-9, 2012. What: The unveiling of the Bigfoot sculpture. When: Tuesday, November 27th, 5pm.